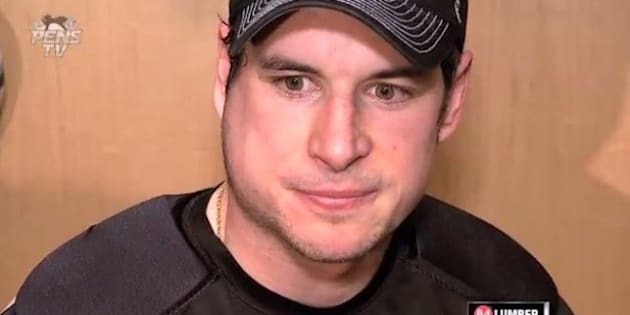 After appearing in an interview on Friday morning with a swollen face, Sidney Crosby is taking a two-game break from playing with the Pittsburgh Penguins — though officials are saying it's not mumps. Mumps, a contagious virus that can cause swelling in the salivary glands on one or both sides of the face, according to Mayo Clinic, has been going around the NHL for the past few weeks. Though in the interview Crosby said he was feeling good, the team's general manager decided to pull him from the game against the Calgary Flames on Friday. Crosby did not participate in practice yesterday due to an unspecified illness, the news site reports. According to the Globe and Mail, approximately 11 players across the NHL — including Tanner Glass of the New York Rangers — have been diagnosed with mumps. The infection is relatively uncommon, as there's been a vaccine widely available since the 1960s. In 2013, for example, there were only 92 cases across all of Canada and 584 in the United States, reports the WHO. The virus is transmitted through saliva, which can be sprayed (as with hockey's violent hits), or the sharing of cups and utensils. Symptoms don't appear until about two to three weeks after acquiring the virus, and it's very contagious for the first week after symptoms show. As with other viruses, it can cause fever and weakness, but patients usually recover within two weeks. The bigger concerns are complications, such as encephalitis (brain swelling) which can occur with a viral infection, orchitis (swelling of testicles) which can lead to sterility, or meningitis which can happen if the virus gets into your central nervous system via your bloodstream, reports Mayo Clinic.